Body autonomy is something that I feel very strongly about and desire to protect in my children. I believe that body autonomy gives children an extra layer of defense against abuse because it empowers them with the confidence to speak up. One of the hardest aspects of this for me was speaking about body parts in their REAL and clinical terminology, and without shame. At 28 years old I went to my own gynecologist with a “feminine issue” that I could barely explain because I was ashamed of the words. And not because my parents (both highly educated and working in medicine) hadn’t taught me these words, either, but because I believed a lie that my body was shameful. I was at a sleepover with a friend in elementary school when I was touched inappropriately. My friend, who was the one who crossed the line, told her dad (in front of me) that I was the one who had initiated her “game.” I remember that feeling of violation and betrayal: feeling like someone I thought I trusted was backing me into a corner and suffocating me slowly, no way to escape and no way to sound an alarm–who would believe me? Who would I tell, and why would they listen? I had enough sense, thanks to my parents, to know that these unsafe feelings meant our friendship wasn’t worth it, and I actually never spoke to the friend or her parents again. I’m not sure what, if any, conversations our parents might have had, but I know this experience shaped future encounters with new people, and caused me a great deal of anxiety for any new sleepovers. Right before Thanksgiving 2017, the Girl Scouts of America released a statement about teaching consent by advocating that parents not force their children to hug or kiss relatives this holiday season (or ever). This resonated with me, because even though I love my family, I often felt uncomfortable kissing relatives I saw only twice a year, at most, and it wasn’t until I was a teenager that I felt confident enough to turn away or offer a handshake instead. Let me be clear: my parents never FORCED me to hug or kiss, but I wasn’t openly and directly given ALTERNATIVES to these unwanted “advances,” and my decisions not to hug or kiss were not openly defended in front of said relatives. Not everything is sexual or abusive, but a kiss from an aunt or uncle who you barely know, as a child especially, can feel like an incredible violation of space and comfort. I wish I’d been taught MUCH earlier on that refusing a kiss or offering an alternative was my God-given right, regardless of any “hurt feelings.” Family dynamic can make bucking this trend uncomfortable at first, and as a mom I now understand this difficult position my parents might’ve been in. However, it took being peeked in on while in the shower by an unwanted guest for me to realize I didn’t care about other people’s feelings: if I didn’t want to hug or kiss someone, I didn’t have to. This was a big step for me, but I want to teach this to my girls early on: CHILDREN ARE NOT RESPONSIBLE FOR THE FEELINGS OF ADULTS or other children. Note that I am NOT saying they are to go about insulting or physically/emotionally harming others without a care. I AM saying that I don’t want uncomfortable experiences, inappropriate touching, or someone else’s display of hurt feelings to be the reason they feel they have no say or control over their own bodies. Upon Beth Moore’s affirmation and recommendation, I bought this book. I didn’t read it right away, either, because as the mom of a 3 year old and 11 month old, I honestly was feeling overwhelmed by all the sexual assault in the news and really just wanted to hole up in the safety of my own house where I could protect them from this world and preserve their innocence just a little bit longer. 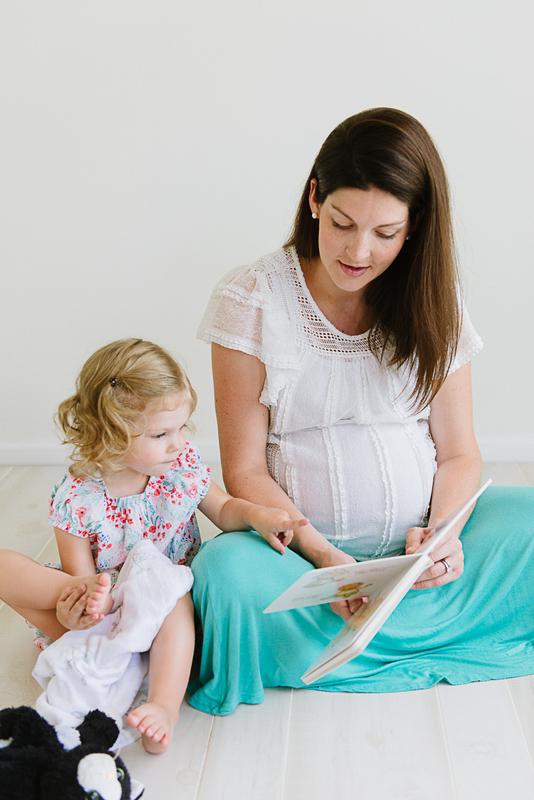 However, I soon realized that starting this conversation early, teaching my girls they have autonomy over their bodies, and using the real names for their body parts is not something that can be done too soon. If not just for them, but for me! To take away the shame, to help it not feel silly to label their body parts by their real names, and to teach them what is considered safe. I want my children to know that if they are in the street and a bus starts heading their way, they have every right to run, jump, scramble out of the way to get to safety–even if it means bumping into someone or hurting someone’s feelings on the way to safety. No one in their right mind would expect them to stand in the path of oncoming destruction, right? Why, then, are we allowing relatives and friends to play the “sad, hurt adult” when a child says no to a hug or a kiss goodbye!? When it comes to their bodies from an autonomous standpoint, why does there seem to be so much grey area? We don’t force Claire (or Nora) to hug or kiss anyone, even us, if they do not want to. Instead of support, I often receive scoffing and disdain. “They can’t even hug So-and-So?” I try, in vain, to explain that yes, we encourage hugging, but we leave the power in their hands. Hugging is one, of many, ways to say hello/goodbye/show affection (we talk beforehand about other ways we can say hello/goodbye such as a high-five, fist bump, wave, and things we can say when someone asks for a hug or kiss when we don’t want to reciprocate: “no thanks,” “not today,” “how about a high five,” “thanks for having me over to play,” etc), but it is HER body and she does not have to hug or be hugged (or kissed, etc) if she does not want to. By the same token, if she wants to give a hug but someone else doesn’t want one, we are teaching her to respect those boundaries as well! A friend that Claire wants to hug is in charge of their body, not Claire. Claire is the boss of Claire’s body. If a friend doesn’t want a hug, that is the friend’s right and we honor and respect and encourage that. I believe that when God created us, He did indeed create us with this autonomy. I do not believe that a 3 year old should be forced to hug/kiss if she doesn’t want to. What does that teach her? You know as well as I do that a hug from someone who doesn’t really wanna hug you doesn’t mean much at all. Why should a child who sees certain family/friends only twice a year (or even once a week) be forced to be up in their face and personal space? I am NOT saying a hug is the same as abuse or molestation in any way, shape, or form. What I am saying is that being armed with the skills to know what to do with your body from a young age makes you more likely to stay safe from abuse, identify healthy boundaries, safe people, and learn how to speak up when something makes you uncomfortable. Listen: I loved my grandparents and all my relatives, but let’s get real. To little kids, old people can be SCARY. They are wrinkly, they often wear glasses, and sometimes they are loud. They scowl when they’re trying to read or hear, and this can be frightening to kids who aren’t used to it. Not everyone has the luxury of being close to family or near enough to older people to be able to understand this dynamic. Not everyone has the luxury of being able to FaceTime or video chat with their out of town relations. Not every person, or child, has the same love language: some people appreciate physical touch as a way of showing/receiving affection, but some people (children included, from a very early age) prefer to show and receive love in other ways. I know this concept will be unpopular with some. This parenting decision thus far has drawn a line in the sand for many we used to be closer to. If you’re still with me, let me be clear: if you choose to mock this important decision to teach our children they are the boss of their bodies, and to keep our children in charge of their bodies, you have shown us that you cannot be trusted to be on their “safe” list. Make no mistake, I take that decision seriously. If you were one of those who opted not to read the book, I wish with all my heart you would reconsider before you judge another parent for doing what they believe is right in keeping their child as safe as possible from harm. Victim blaming is wrong, undermining another parent for how they chose to raise their child is wrong, and I believe there is abundant scriptural evidence to support this. Jesus defended the rights of children, and He gave us, as parents, the right and responsibility to raise them to know they are fearfully, wonderfully, perfectly created in His image. 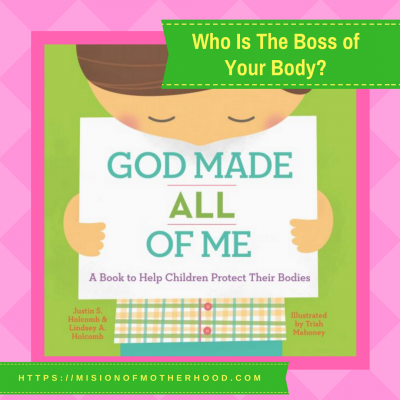 If you’re still not sure you agree with my stance on body autonomy especially for children, I encourage you (implore you) again to buy the book. It is well done, includes talking points for parents, and is very kid-friendly. Thank you for listening, and may you learn the truth of God’s creativity: He made all of us, and He made you the boss of your body. It is right and good to keep our bodies safe.